We are now open everyday from 10-6. A wide variety of apples including Honeycrisp, Kinderkrisp, Intensity and Autumn Blush are now on the shelves. Apple pies and Applecrisp fill the freezer and many Jams and Jelleies are available. The Jungle Book maze is open. Horse drawn wagon rides will run on weekends Sept.29&30, Oct.6&7, Oct.13&14, and Oct.20&21 noon-5 weather permitting. Weekend customers frequently arrive expecting all of our apples to be sold U Pick with the expectation that this is just how orchards work. We, as growers are puzzled where this idea came from since it is fairly new and only small percent of all US grown apples are marketed this way. We didn’t start out as an apple orchard but gravitated in this direction because we realized that we were able to grow the kind of apples (sweet/tart, fresh and crisp) that many local apples lovers were looking for, but often, not able to find. For us, it’s always about the presenting a variety of excellent apples to meet all tastes. We have perhaps taken this to extremes by test growing new U of M selections, rare varieties from other areas and even growing out seedlings and selecting new varieties here at the farm. 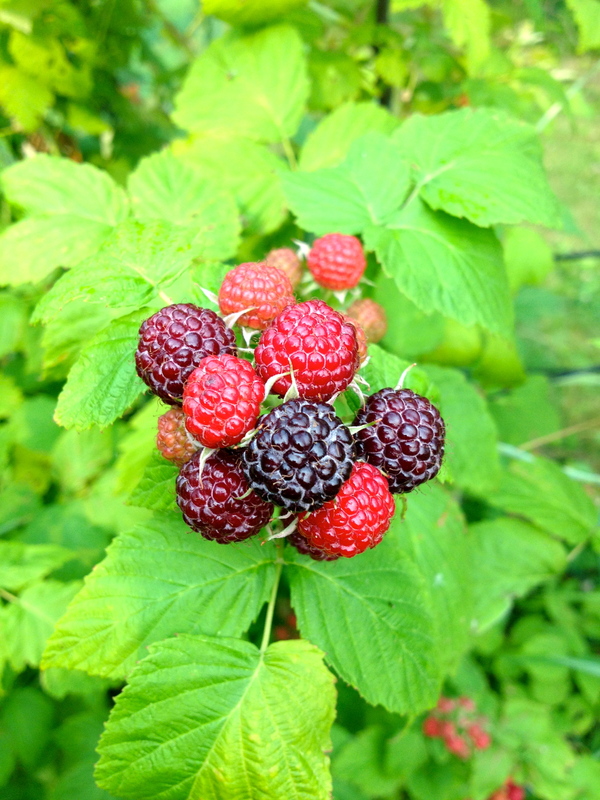 This last bit has worked out far better than expected and we offer, in season, half a dozen varieties of our own making including Kinderkrisp, which we have patented and is grown nationwide. All these small blocks of different varieties that we try to keep an eye on and use effectively don’t lend themselves to the concept of customers roaming the entire orchard, picking fruit wherever they want. The gap in expectations between growers who are interested in the best possible apples and customers who just want to pick some apples from the tree is large and sometimes leads to frustrations. We find it hard to briefly communicate our point of view. However, we are committed to meeting this demand more effectively and to find ways to make it work for people who want to pick their own and for us who need to control what happens in the orchard. Marketing apples by “pick you own” is a concept that has rapidly become more popular. Enthusiasts are often surprised to find that an orchard is not devoted exclusively to u-pick. Extensive u-pick opportunities can cause complications for orchards planted to optimize varietal choice and quality in ways that are hard to explain in quick sound bites. This is a challenge that we at Fairhaven Farm have been grappling with in an attempt to make more u-pick opportunities available for our customers. Toward this end, we have planted an area that is somewhat separate and is on the way to other u-pick fields. This new u-pick planting includes varieties popular with consumers that ripen at different times of the season and improve in quality as they hang. In the mean time, we have been moving the u-pick area to an aisle in the orchard the provides some good choices for the u-pick customer. This week we have opened an aisle that has Intensity, sweet /tart variety, on one side and Kinderkrisp , a popular new sweet variety on the other. By moving the u-pick to other areas in the orchard we will be able to offer u-pick on weekends for the balance of October. Even though I am always working Saturday mornings, and most evenings, I’ve often daydreamed about an ideal weekend day spent in the heart of the lakes area. If you are traveling from hours away to visit the farm and want to make a day of it, here are my recommendations. If I had my druthers, and even when I don’t, I would start my Saturday morning early in Annandale at the farmers market. 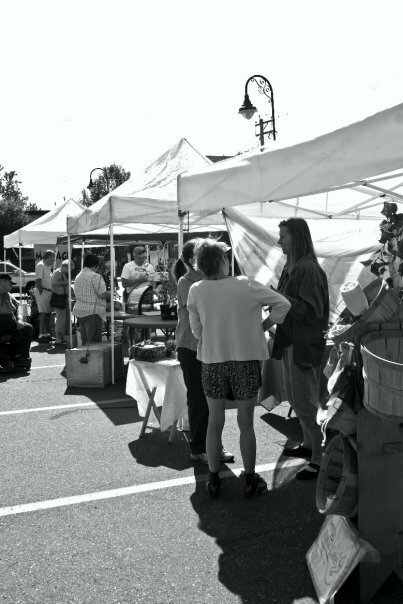 The market opens at 8am in the city hall parking lot in downtown Annandale. I recommend strolling in around 8:30 even if you’re a lil groggy. 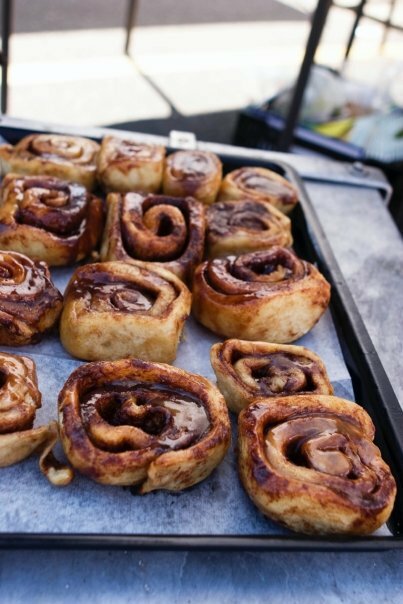 Grab a caramel roll or honey-nut bagel from PapaTom’s stand, then wander right over to In Hot Water Coffee & Tea, a mere feet away, to buy some delicious coffee. Full disclosure: PapaTom is my uncle and I previously worked five years at the coffee shop, but both stops are beloved local favorites. To get the full effect, just hang out here for awhile. Take a seat in the coffee shop, and then walk around the market. I have overheard some unexpectedly fantastic conversations here over the years. 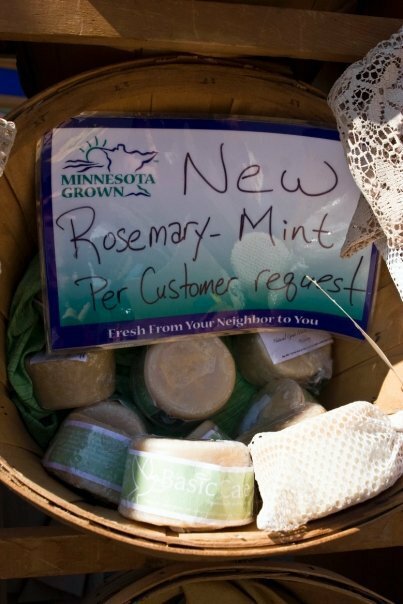 Most weeks at the market you can find Basic Care natural body products, organic produce from French Lake Farmer, baked goods from PapaTom, jam and produce from us (why I never have Saturday off), bread from Diamond City Bakery, Frisky Rooster salsa and bloody mary mix, and fair trade home goods. This market is small but lively. I’ve watched it develop since its beginning almost ten years ago, and its become a tradition for so many in the community. Unfortunately PapaTom won’t be finishing the 2015 market season, largely because the hornets have been such a problem for him this year. However, we will be selling amazing apple empanadas, and Diamond City offers cinnamon rolls. Once your coffee cup is empty and you’re needing to walk off that caramel roll, drive about 5 miles to the Wright County Swappers Meet. This isn’t a Brooklyn style flea market, or a quaint set of stalls selling hip, artisanal products. This is a full on genuine central Minnesota experience. 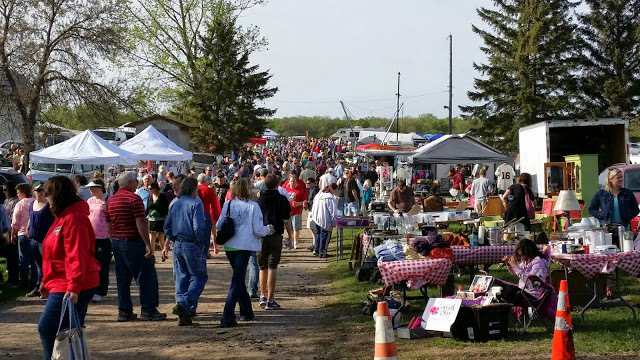 You’ll find cotton candy, blueberries, puppies, mini donuts, golf carts, lots of beanie babies, .50 cent books, hand carved furniture, and treasures that have probably spent more time in a garage than outside of one. I might not be selling the experience that well but I highly recommend the trip. You’ll find penny pinching locals, wealthy cabin owners, smelly homesteaders, and tourists all walking the same paths through the swappers meet. It’s a collection of all that is good and honest about this area. Lunch: there are plenty of food vendors at the Swappers Meet, mostly items like cheese curds if my memory serves me right. You can also head back into Annandale to eat at Jules Bistro, or enjoy a hamburger at LaLa’s bar and grill in South Haven. Otherwise you’re always welcome to bring your own lunch for the day and eat at the farm. After the Swappers Meet you’re only a few miles from Fairhaven Farm. We offer a handful of activities including: U-pick apples (only Zestar), grapes, raspberries, and pumpkins, and our themed corn maze this year featuring Peter Rabbit and Friends. We also have a gorgeous rock garden anyone is welcome to walk through, and a collection of funny looking chickens that kids find more entertaining than you can imagine. In our renovated barn we offer honey, maple syrup, apple pie, apple crisp, caramel apples, Popcorn Patty caramel corn, squash, sweet peppers, jam, and Flanders pottery. The last stop of the day is less of a recommendation and more of a requirement. Do yourself a favor and stop at Spilled Grain Brewhouse in Annandale. Just opening this summer, the brewhouse has found fast and well-deserved success. Our family favorite is the Highest Point I.P.A., but none of us has had a beer we don’t like. The inside is rustic in way that can be enjoyed by either those prefer the finer things in life, or those who just need a lawn chair to feel comfortable. Some nonalcoholic beverages are available if the kids are with you, and the back has foosball, and air hockey. There is even a basketball hoop outside. After reading this itinerary my mother has announced she’d like to take a Saturday off to do these things. Not likely she’ll be able to alter her schedule, but you are certainly more than welcome to take the day off! We hope to see you soon. Honeycrisp, Zestar, Autumn Blush, KinderKrisp*, Chestnut Crab, Peachy Keen*, Intensity*, Shizam*, and 1837. Under the Apples tab you’ll find an apple calendar and descriptions of most apples we offer. We’re all thankful the temperature has cooled, and more importantly that the humidity shrunk down to nil. When the humidity is high it can feel nearly twice as bad in the orchard. Dave and Peter returned with bins of apples and soaked t-shirts. But like Peter kept saying all last week, “I don’t mind picking in the Fall, but this doesn’t feel like Fall,” and now it’s starting to feel more like the seasons really are in the midst of change. And as the humidity drops, the apple cooler fills. We’ve doubled the amount of varieties available from the end of August. We now have Zestar, 1837, Autumn Blush, Ginger Gold, Chestnut Crab, and three of our own varieties, KinderKrisp, Peachy Keen, and Shizam. Shizam is one of our newest additions. It’s tall and narrow as far as apples go, with a hard, dense texture, low acidity, and a flavor reminiscent of that evanescence one finds in Sweet Sixteen and Keepsake. It is certainly one of my apples of choice. The other apple I will advocate for is the Chestnut Crab, which is not one of our own varieties, but good nonetheless. This is not your grandmother’s crab apple. Don’t send her just to make jelly with them. 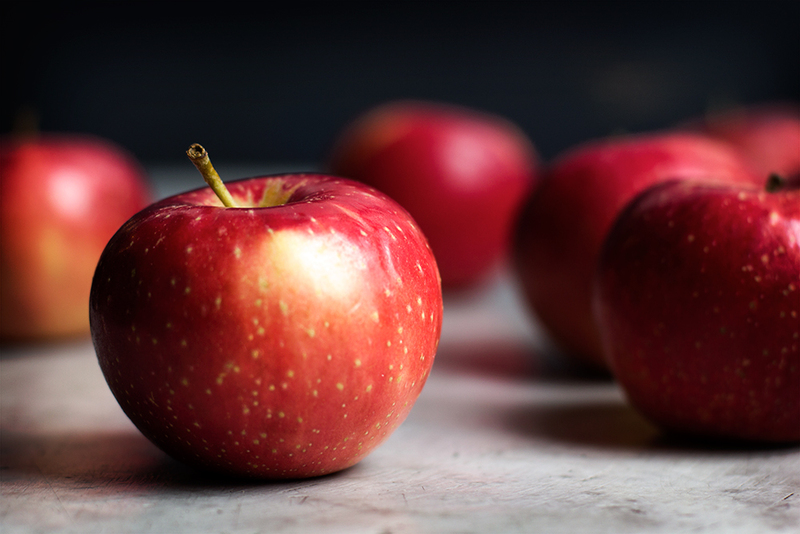 These are beautiful orangy red apples, with a a satisfying crunch, sweet honey-like flavor, and the perfect size for kids (or adults) who have a hard time finishing a whole apple. This apple is also my personal favorite for cider. The time has come. Many of you have been asking me when our KinderKrisp apples will be available and the answer is NEXT WEEKEND, that being the first weekend of September. We will have bags available in our retail shop and at the Annandale Farmers Market. For those who are not familiar, KinderKrisp is an apple variety developed by Fairhaven Farm owner/operator David Macgregor. You may know David as the slightly disheveled, eccentric guy that drives the tractor between the orchard and barn, and who may resemble Beatrix Potter’s Mr.McGregor character at times. David first got involved in the fruit business when he was breeding grapes in his teenage years. Since then, he has moved onto breeding new varieties of apples that we are excited to offer at our farm. KinderKrisp is our most popular apple, with a wonderful sweet-tart flavor, and a crisp texture reminiscent of Honeycrisp. It’s the perfect size for kids’ lunchbox. You can read more about KinderKrisp here in an article featured in gourmet food magazine, Saveur. 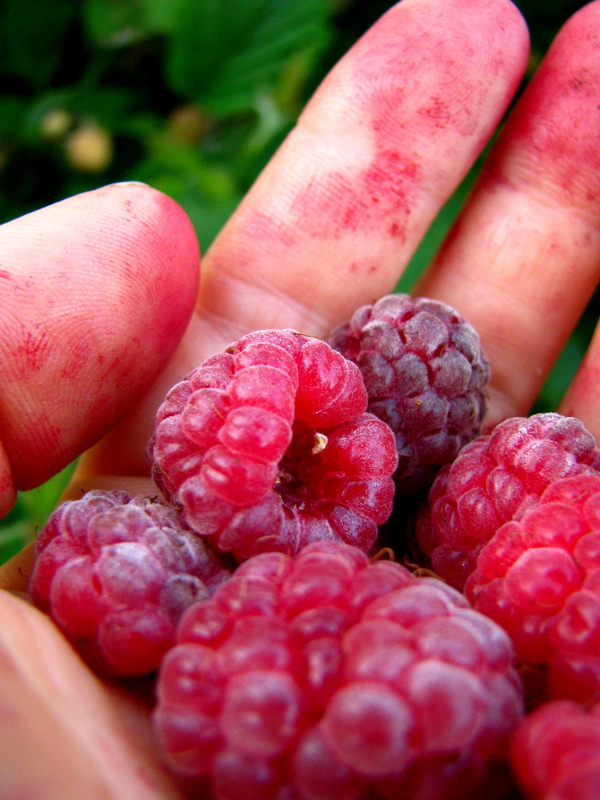 I’ve also been receiving dozens of inquiries about U-Pick raspberries just about anytime I leave the farm. I’m happy to announce that the patch will be open Labor Day weekend. Show up to pick any day between 10 am and 6pm. Enter through the barn and someone will instruct you on where and how to pick. We charge by the pound, and please bring your own containers. I’ve been pretending I’m a studio arts major these past few weeks, while designing and painting the characters for this year’s corn maze. What book series includes rabbits, frogs, ducks, kittens, and a grumpy old man? 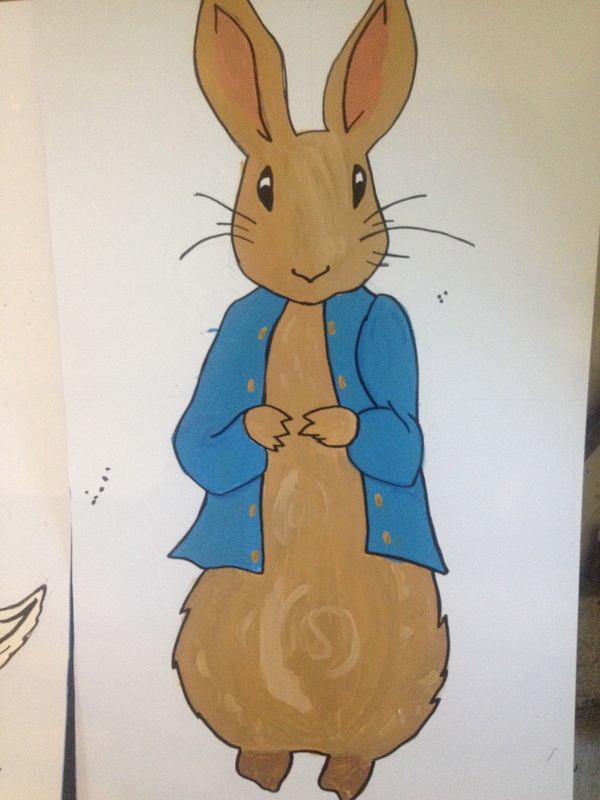 This year’s theme: The wonderful world of Peter Rabbit and friends created by writer and illustrator Beatrix Potter. If you live anywhere in central Minnesota you’ll know that this summer’s rain has encourage the corn to grow taller than we’ve seen in years. You’re not going to be able to see over any corn stalks this year! Are you wondering what to do with strange jam flavors like grapefruit smoked salt, raspberry jalapeño, or orange vanilla bean? So did our family when suddenly our pantry was overrun by jars of jam. At first we started using jam more as sauce and syrup. My mother and I would mix jam into our bowls of plain greek yogurt instead of adding sugar, and slathered pancakes or waffles with three fruit marmalade or blueberry lime. 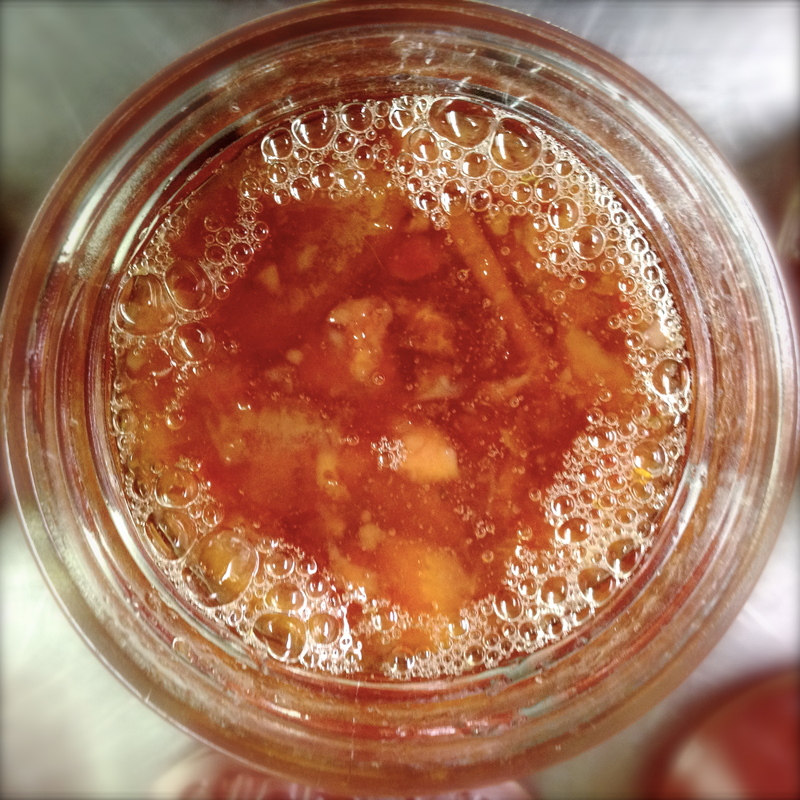 My father would use jam like tomato ginger jalapeño or peach cardamom as marinades for chicken or pork chops. Mix all ingredients together and whisk until you reach your desired consistency. If it feels too thick, feel free to add more olive oil. If you’re looking for more protein, or just general substance in your salad I recommend adding a tablespoon of tahini or any other nut butter. Mix gin, lime juice and jam into durable glass. Whisk well to make sure the jam mixes with the other liquids. Once mixed, strain into a 8 ounce glass, add tonic water. Other ideas: tomato sauce, pasta & jam, eggs & jam, cheese, mix into whipping cream, substitute for sugar. Share your recipes with us at our Facebook page. Use the tag #fairhavenfarmrecipe!